Now that school is back in session, it has been much easier to do my research. 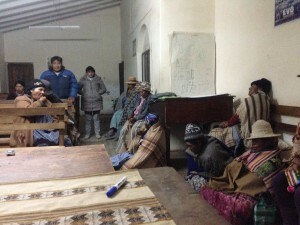 Here at Quillacas, we quickly aranged an impromptu meeting of women quinoa growers and the Dirigentes Originarios. Quillacas High School seniors, survey administrators. I also was able to meet with the high school seniors and teach them to administer my circels of sustainability surveys. The students surveyed over 57 community members in just 10 days! I donated 300Bs to their end of the year school trip as a thank-you for their good work. Photo in heading: My “office” at Ester’s house in Quillacas. Thank you Ester! Dona Veri and her chicharon de llama. 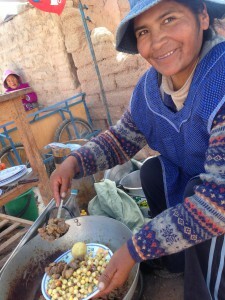 A fried llama dish served with local mote and chuno. As I explored the Fair Trade value chain, I visited with Yeres and Ghita of Andean Family Farmers, the technical/producer arm of Andean Naturals, one Saturday morning at their Oruro office located in a tall building in the middle of the busy Cochabamba street market. There they shared some stories and data with me. Their Fair Trade certification is managed by Europe’s FLO Cert (I have an interview with Tito the certifier, in two weeks). They tend to work more with smaller producer groups and independent farmers than their European Fair trade counterparts who prefer large worker-managed associations. Their US certification comes form Fair trade USA. Andean Naturals ships an average of 20 to 25 containers of both Fair Trade and organic quinoa flakes and grains from Bolivia a month. They are hoping to soon to be working with Costco as a US client. The minimum Fair Trade price for a ton of quinoa is set by FLO at a world standard of $2,600 a tonelada. Currently the Bolivia Fair Trade price is at $2,800 to $3,000 a tonelada, which is significantly lower from last year’s $6,000+ a tonelada price. The FLO Fair Trade world price for quinoa, is not at a sustainable level for the Bolivian farmers who purposely produce lower yields using more artisanal, indigenous methods, being careful not to overplant their lands. Despite lower world prices for Fair Trade quinoa, Andean Naturals strives to continue to create value and develop new market ways to maintain their Fair Trade purchases at a fair price for the Bolivian farmers. Yeres and Ghita admit that sometimes it has been difficult to administer the social premium fund paid by Andean Family Farmers, but as their producers are becoming more organized and understand better how the funds are to be used (for community, not association development), these funds are arriving at producer locations. One association used their funds to benefit the community school children providing books, pencils, pens and backpacks for all children. Another association invested into a study of beneficial plants for pest control, natural fertilizers for the soil and a higher quality pre-cleaning system. 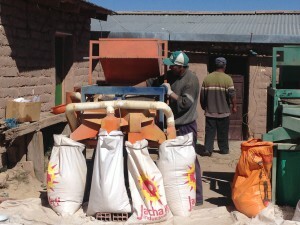 Andean Naturals is helping a Kellogg Foundation project to partner with another community to bring solar panels and basic sanitation in the forms of wells and latrines to a quinoa growing region that has not yet been electrified or received these services. At this meeting (two weeks ago), we set up my travels to Quillacas to meet some of their Fair Trade producers. Now I am in Quillacas with the producers and it has been a great visit. Yesterday, Ghita and Ximena from Andean Family Farmers stopped by to introduce a La Paz reporter, Cecilia, who was studying rural child nutrition, to the community and see how Eufraen’s quinoa shipment was going. We had a nice lunch together of chicharon of llama (fried llama), mote (rehydrated corn) and chunos (recydrated pottoes) all local and organic, very delicious! Then I was off to teach a marketing lesson to the Quillacas 8th graders while the women went to visit a rural community they had arranged to see. It was a short, but nice visit. As I follow value chains: the organic Bolivian quinoa from the Brattleboro Food Co-op to the US UNFI distributor, to the Quinoa Foods Company exporter in La Paz, to the farmer, the Beliz family in the community of Ciqulacca, outside of Salinas (which I hope to visit on Monday), I start to see values in the relationships, points of view, cost structures, and challenges that the people on each link of the chain face. Fair Trade brings a new dynamic to the chain where more complex relationships are formed. The standard organic value chain is one of pre-set prices, filled orders and compliance. However the Fair Trade, organic value chain also brings an important relationship exchange. No longer are producers simply responding to the demands of the exporters; they are collaborative partners with them. The exporters bring producers to their export countries in Europe and the US, introduce them to international markets, and work with them to determine fair prices and export strategies. The result is a more robust relationship, loyalty, a greater understanding of the markets and customer demands, and more autonomy and empowerment for producers. I find the Fair Trade producers to be more open to new market approaches, diversification, and branding. They are empowered and are more apt to take the initiative on new ventures and act as leaders both within their organization and their community. I took you to the APQUISA Fair Trade organic quinoa growers association of Salinas a week or so ago, and we will visit them again this Sunday when they hold their annual meeting to determine what their export quinoa price will be with FLO (the European Fair Trade certifier). Now I am in the small town of Quillacas, at the entrance of the Quinoa Real growing region close to the quinoa Black Market of Challapata. Here members of APROQAY (Association of Producers of Quinoa, Cayne) are preparing 5,000 pounds of quinoa for export through Andean Family Farmers, the Oruro-based producer branch of the US Fair Trade, organic quinoa company, Andean Naturals (Featured in the Day 16 posting on the blog). 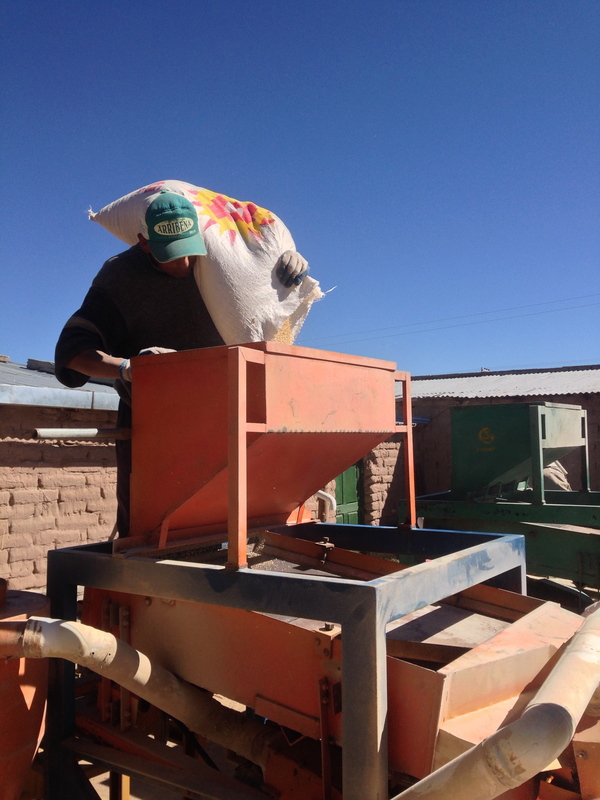 A truck is coming later today to take the grains to Andean Natural’s Jacha Inti processing plant in El Alto, 7 hours away. Loading Fair Trade quinoa into the sorter and cleaning machine. APROCAY, Quillacas, Bolivia. 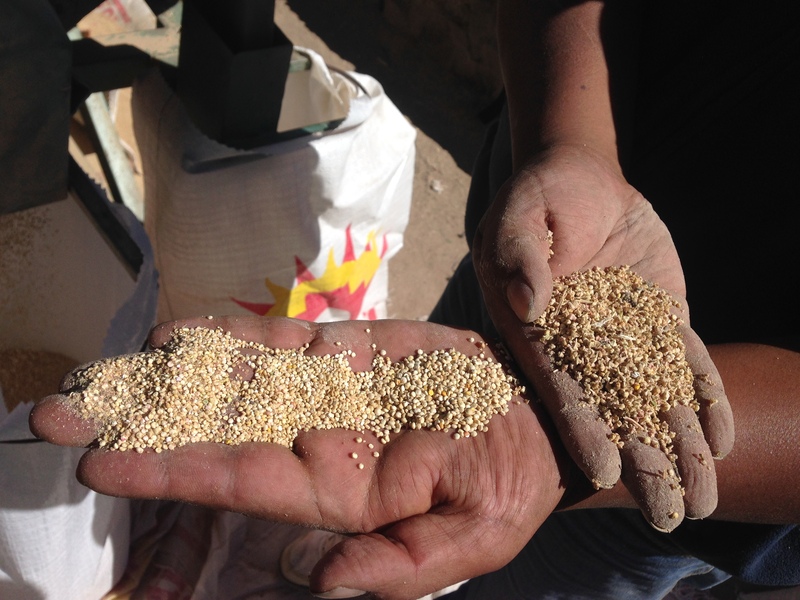 This quinoa will then be professionally cleaned and processed at the Jacha Inti plant in El Alto, 9 hours away. 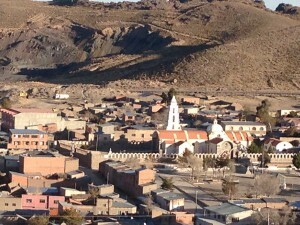 Originally Eufraén and 300+ other organic quinoa growers in Quillacas were members of PRODESQUI (Inter-salar Producers of Quinoa) in early 2010 or so. This large group was producing organic quinoa but did not know about certification processes, organizational leadership or how to manage large projects, such as a quinoa processing plant the Bolivian president had recently built in their community. Never-the-less with the growing demand for quinoa and raising prices, there were determined to learn what they needed to in order to produce the best quality qinuoa for the best markets. Their big break came when representative of ENRI, a US quinoa buyer was introduced to the community by Wilson’s QUINBOLSUR. y who’s quinoa was in the Brattleboro Food Co-op), was present to help with the communications. All seemed to have gone very well and Eufraén and PRODESQUI were proud of the presentation they made feeling certain it would lead to new quinoa sales through QUIMBOLSUR. 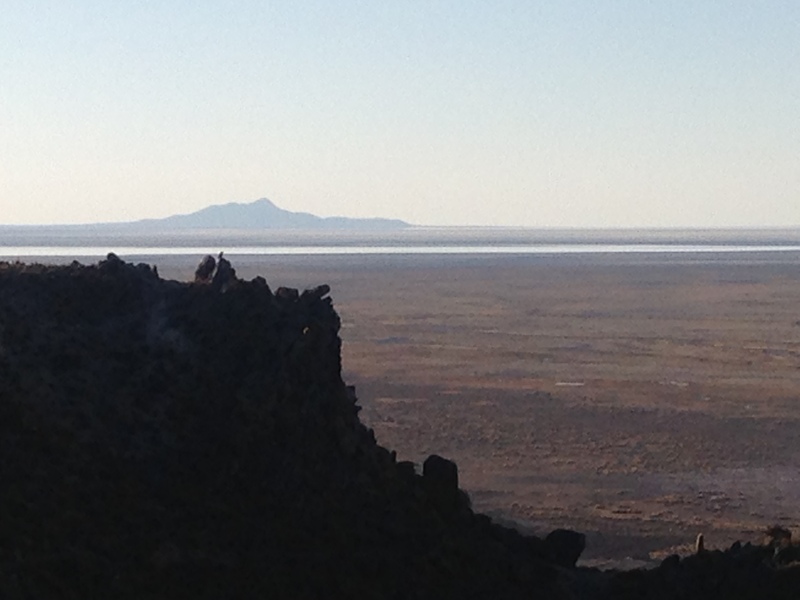 A few weeks later a PRODESQUI member looked up the ENRI website and found a posting of the visit to Bolivia, with photos of Quillacas and the celebrations there. However, there was no mention of Quillacas nor PRODESQUI, all was presented as if it was QUIMBOLSUR. The members of PRODESQUI were dismayed and felt cheated and taken advantage of. They lost their confidence in QUIMBOLSUR and did not want to work with them. Meanwhile another opportunity came. This time it was ZTA and APAE. 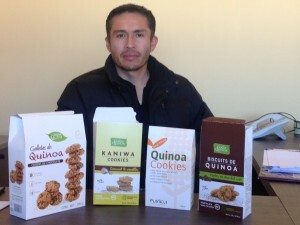 They wanted to purchase a container of quinoa (5,000 pounds) direct from PRODESQUI. They gave PRODESQUI a month to clean the quinoa and three months to get the container through customs to the port of entry. However PRODESQUI felt the risk was too great. They would be putting thousands of dollars of their own product in the hands of others they did not know, plus they would need thousands of dollars more for the cleaning, shipping, and documentation. They would need to take out a loan, hope the shipment was received, of god quality, that payment made and they were able to pay back the loan in time as well as themselves. It was too much. “What if the boat sank or their container was lost?” they asked. They declined the offer. Three grades of quinoa: 1. Small sandy quinosa that gets sold at half price where it will be cleaned and ground into quinoa flour sold in the local market. 2. SMall quinos seeds ready for final processing. 3. Larger quinoa seeds ready for final processing. 4. Quinoa seeds that still need to be removed from the seedhead plus plant debris. A third opportunity came with the offer of a $2,000 organic certification. At this time, the price for certified and non-certified organic quinoa was essentially equal so many producers dismissed the certification as unnecessary. However something about this caught Eufraén’s attention. He looked into this more and soon met Sergio from Andean Foods, who was in the country looking for certified organic growers to partner with in his Fair Trade company. They immediately struck up a friendship and Eufraén and 24 other producers left PRODESQUI to form APROCAY, collectively paid for their organic certification, and started producing for Andean Family Farmers (the Bolivian production branch of Andean Naturals). Eufraén in particular liked the terms that Andean Family Farmers provided, Andean Family Farmers was obligated to buy the APROCAY organic quinoa no matter what, though APROCAY could decide how much of their product they wanted to sell. 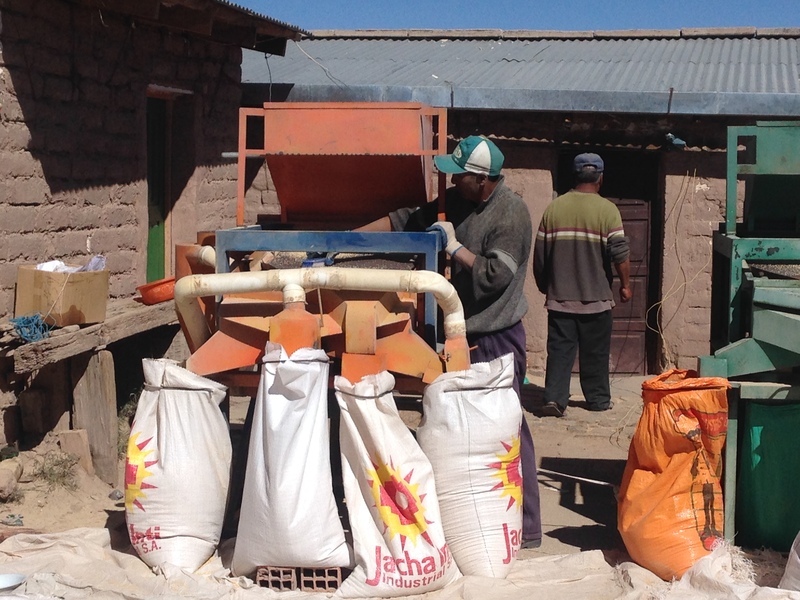 Prices were set together, with APROCAY suggesting the price they wanted and a final price being agreed upon at Andean Natural’s Jacha Inti processing plant once the quinoa was reviewed for quality, moisture content and cleanliness, which affects the product’s final weight. Quinoa is purchased in 5,000 pound lotes (lots) or 500, one quintal bags weighing 100 pounds each, so weight is an important variant in final purchase prices. For the next shipment, Andean Family Farmers suggested APROCAY open a bank account at the Central Bolivian Bank (BCB) in the nearby city of Oruro. They would send payment to this bank account and Eufraen could write checks to the member producers which they could come to the city of Oruro to cash. He was dubious. He did not think the farmers would believe in this system. Besides the market price in Challapata had just risen to 1750Bs a quintal, higher than the Jacha Inti price, but less stable too. Never-the-less, he gave it a try. Working with Jacha Inti and using a bank account seemed better than carrying around boxes of Bolivian money and relaying on the whims of the Challapata market. 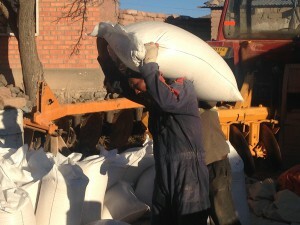 This time he received 380 bags of quinoa (from the 500 that were pledged). The producers immediately received their checks, brought the pieces of paper to the bank, and sure enough received cash for them. They were sold! Next time an order came, all 500 bags of quinoa were present. The long term result of this was that farmers learned how to open bank accounts, save their money and plan their finances. A down side of this is that with such easy access to banking, many (about 70% to 80% of all members) also took out mortgages for a house in the city of Oruro, construction or car/tractor loans (amounting to a maximum of $10,000 per loan). With this year’s lower quinoa prices, these loans are more difficult to manage. Before the loan was easily paid with the money earned from the sale of just 20 bags (quintals) of quinoa, now it is more difficult. The average family is produces about 76 bags of quinoa a year, so loan payments today can take up almost half of their earnings. Today APROCAY has doubled in size to include 52 families with over 300 acres in rotation. This means that at any given year about hectactres of quinoa will be planted. With an average yield of 10-14 quintals per hectacre, this represents about four lotes of quinoa a year that can be sold to Andean Family Farmers. In 2014, Eufraen took his first trip abroad, to the quinoa grower’s conference in California, at the invitation of Andean Family Farmers. Here he saw many new innovations in the quinoa market, met producers, researchers, agronomists and visited businesses such as Eden Foods and college campuses in Washington state. He had cultural exchanges with the US as well, visiting migrant communities and learning of the hardships that many Americans faced with housing and food insecurity. As impressed as he was with the US zeal and energy in support of the growing quinoa market, he was glad to return to the US when the visit was over. 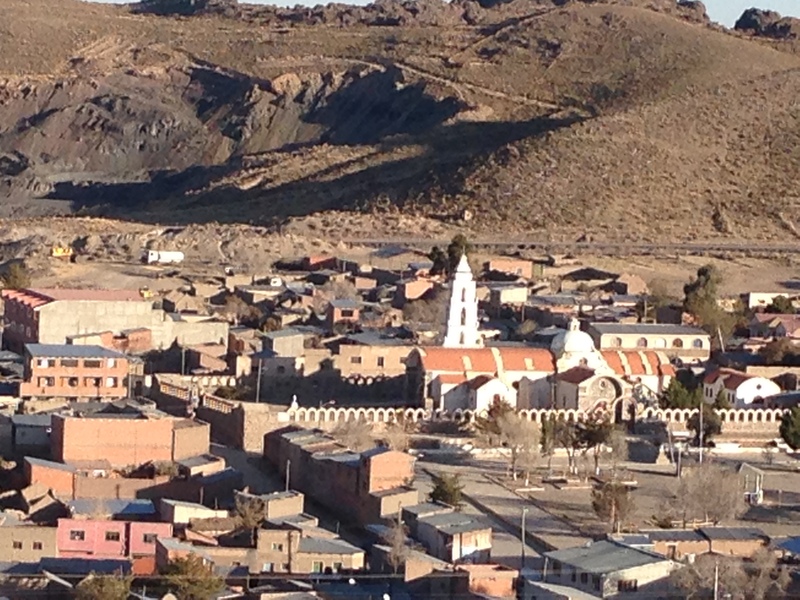 He likes the quiet pace of Quillacas, the friendly villagers who he all knows by name, and the celebrations and festivals which the Bolivians are so good at hosting. He continues to refer fondly to his friendship with Sergio and is proud of the relationship that has formed with Andean Family Farmers. I wished him a good trip as he and Milton boarded the large truck loaded with 5,000 pounds of APROCAY quinoa en route to the Jacha Inti processing plant. He expected to get about 700Bs ($100) per quintal for his quinoa this time, 60% less than last year’s price. 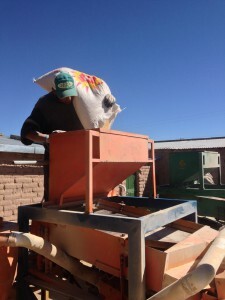 Often APROCAY pays 8,000 to 9,000Bs for the trucking of the quinoa, as well as a 3Bs for every sack carried by the workers and 2Bs for maintenance, amounting to about 15Bs per sack, paid for by the producers. Eufraen and his technical staff always accompany the quinoa to the plant where it is then analyzed. This is how they learn of improvements or variations in the product which they can then address back in Quillacas. It is also a good time to touch base with the Andean Natural counterparts and celebrate in the work well done. Another benefit APROCAY receives through their relationship with Andean Foods is a social premium paid back to the community. 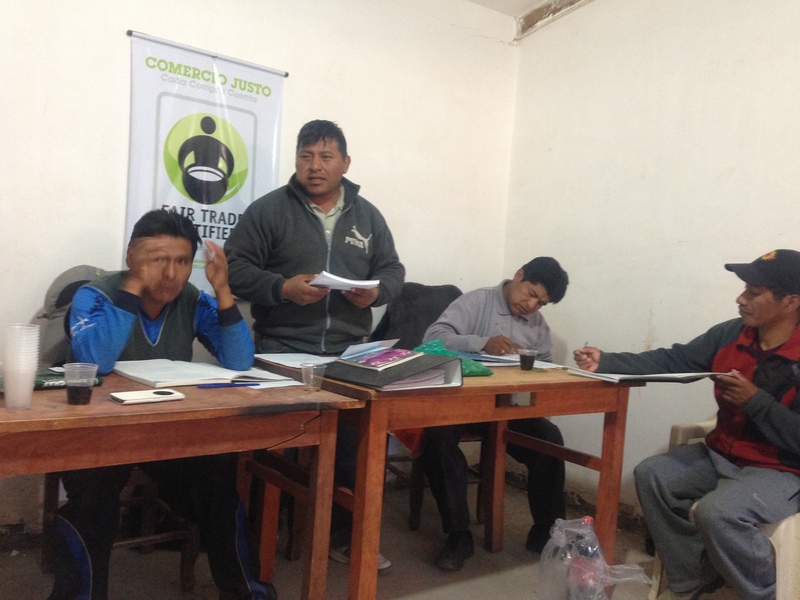 Two years ago, the Fair Trade certification from FLO cost APROCAPY $4,000. They received half of that back from their social premium fund valued at $250 per ton of product sold, explained Eufraen. APROCAPY expects to receive as much as $15,000 in social premium funds for last year’s sale plus another $5,000 from the year before which were not paid yet. According to Fair Trade rules, 30% of these funds need to go towards natural environment projects. The rest, about $14,000, APROCAY decides themselves what to with in an assembly. Eufraen thinks the funds should go towards an interest bearing “social security” fund to cover medical costs for illness or injury amongst APROCAPY members and their families. Once the funds come in, the association will take a vote and a decision will be made as to how to best use them.